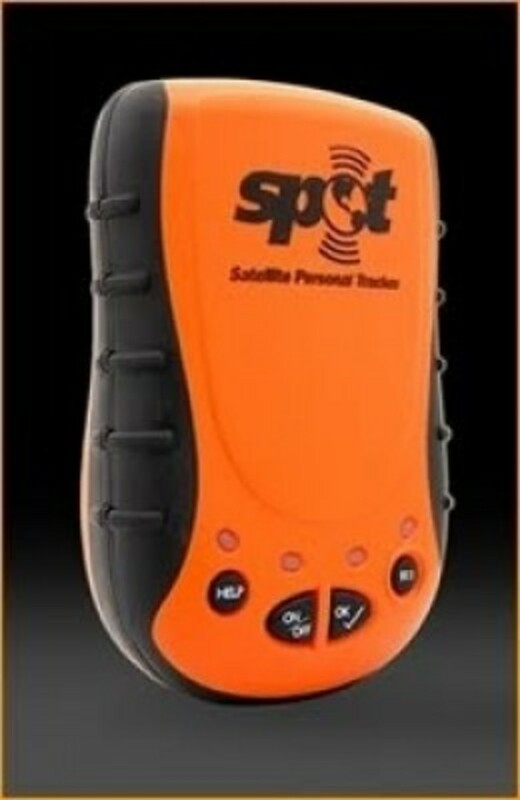 The main purpose of man-tracking is to determine the lost or missing person's direction of travel, which can greatly reduce the size of a search area. 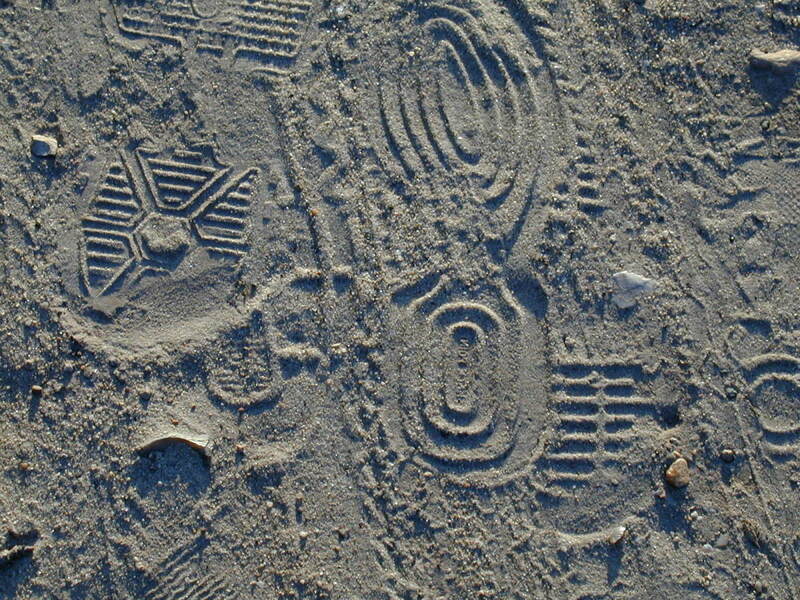 So wouldn't it be nice if all footprints were as obvious as this one? But obviously they're not. And that's where some tools, tips, and a grab bag of tricks come in handy, not to mention a lot of practice for those involved in man-tracking for law enforcement, Search and Rescue, the military -- anyone who wants to find someone who's recently passed through an area. Here, I'll cover some of the key points I've learned about tracking as a Search and Rescue volunteer, both in the classroom and in the field during trainings and actual missions, and provide some additional resources for reading and man-tracking workshops. 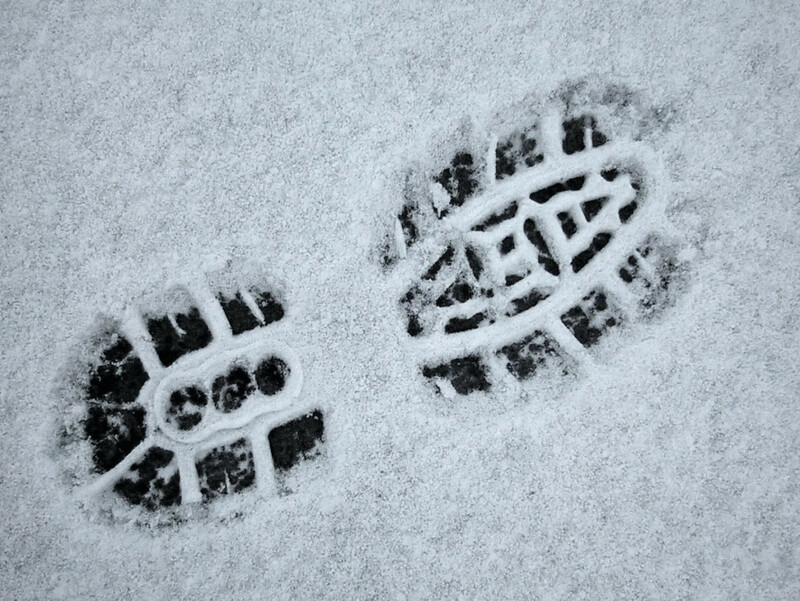 Most trackers use some type of stick to measure stride and footprint length. 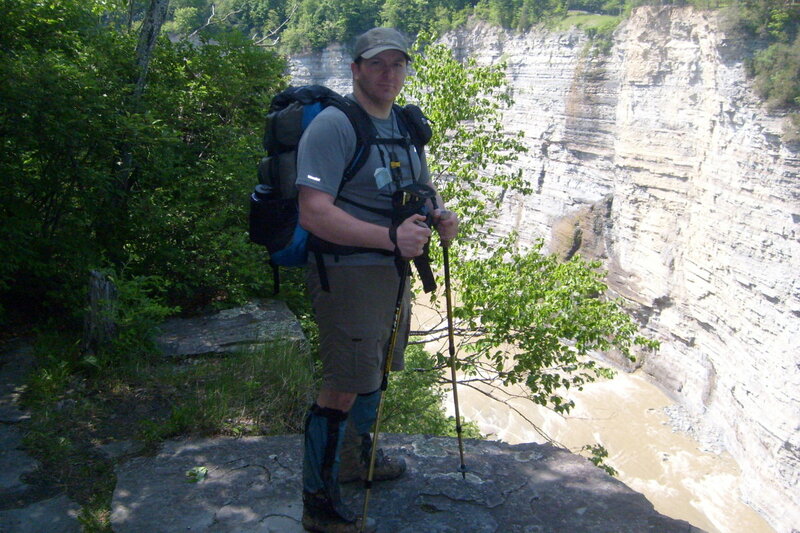 I've found that an adjustable, telescoping trekking pole is a great multi-use tool for this purpose. You'll also want to have some tape or rubber bands to wrap around the tracking stick to indicate your measurements. 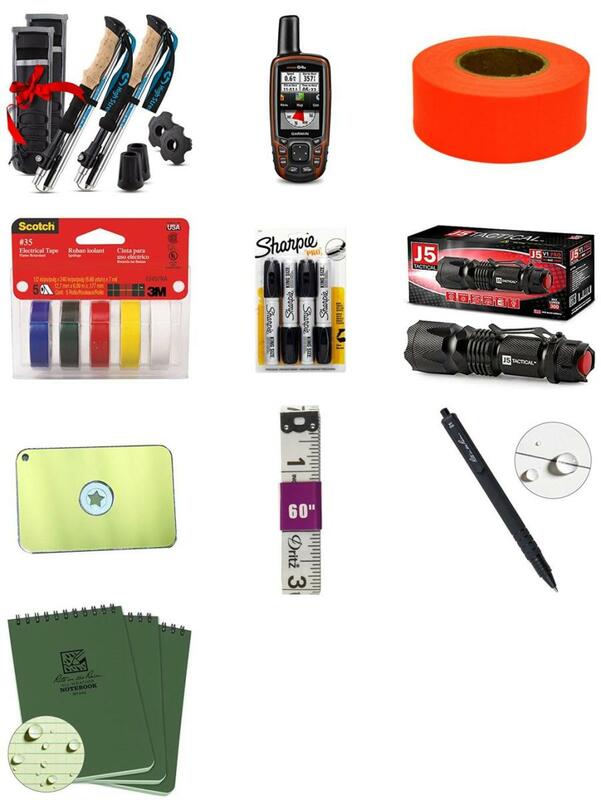 You can build your own man-tracking kit below. 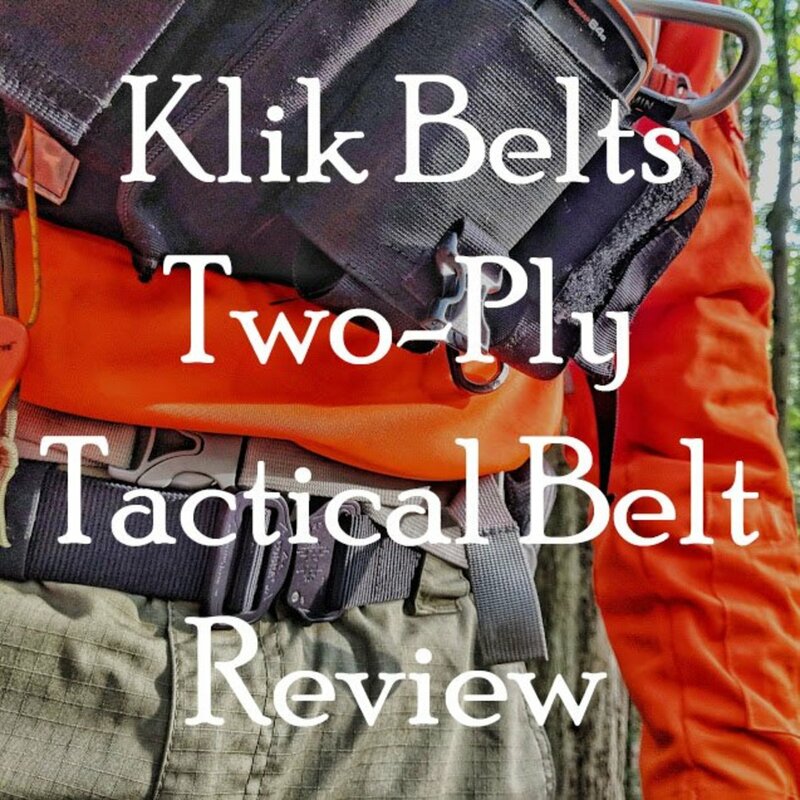 All of this gear should be carried in addition to the rest of your 24-hour pack gear, so you'll be prepared for whatever conditions and situations you encounter in the field. Electrical tape adheres well to a tracking stick and won't slip. Rubber bands can move and throw off your measurements, but tiny bands like orthodontic elastics work well also. As soon as a reliable (or at least probable) track is located, it should be encircled, a sketch should be made of the print, and certain notes should be taken by all members of the tracking team. Is it a right track or a left? Is it a flat track without a heel, or is there a heel and toe? Is the toe rounded, pointed or square? Is the leading edge of the heel straight or curved? Is the instep high or low? What is the sole pattern? Does it have a border? Does it have labels, numbers, nails or stitching? What is the pattern type? Plain (no pattern), regular or irregular? Are there bars, ripples, diamond, herringbone or other shapes? Does the pattern have circles or semi-circles, arcs, stars, suctioncup circles, bars (straight, curved, diagonal)? Check out the SoleMate footwear database of shoe patterns. What is the size of the print? Take measurements: heel to toe, across the widest part of the toe and across the widest part of the heel. Can you tell anything about the person's gait? Toes in or out? Deep heel or toe dig? A limp? Does the print look like a tennis or deck shoe, a boot, a gym shoe, etc.? Here's a handy Track Identification Form you can print out and use, compliments of David Thompson Search & Rescue Assn. is the track searchers will begin with. It is a clear track that is easy to follow. The tracks you see here are good examples of "grandma tracks." Measuring stride is important in finding and following additional tracks. 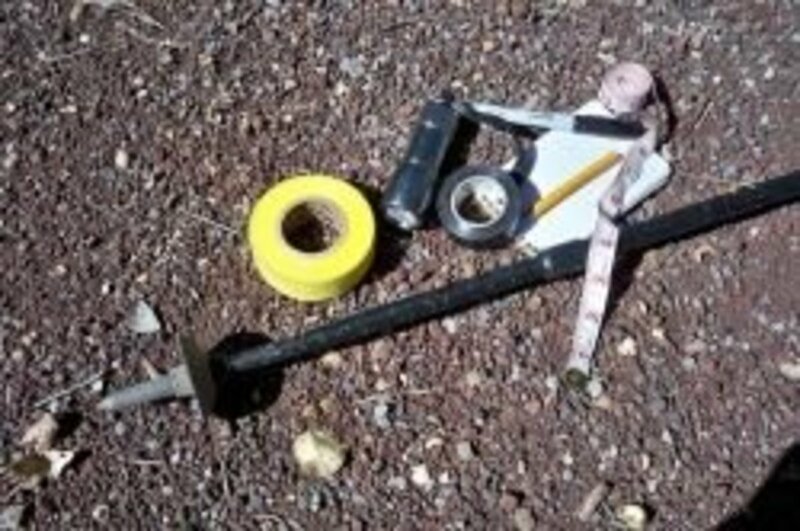 You can take this measurement by using your tracking stick and tape. Then, put a piece of tape around the stick at the point where the heel begins on the rear track. Next, put another piece of tape around the stick at the toe of the rear track. This way, you've got two pieces of tape defining the length of the print and, from there, the tip of the pole defines the length of the stride. Once the first person has measured the print and stride with their tracking stick, the other tracking team members can adjust their sticks and apply the tape by going off of the first stick. This will speed up the process. **NOTE: I've learned that, when measuring stride, it's better to place the tip of your tracking stick at the center of the front track rather than at the heel, because when you use your stick to find the next print, you know the tip should be somewhere within that print ... unless perhaps the person jumped or lengthened or shortened their stride somehow, possibly by running or slowing down or due to steepening terrain. What you want to do is place your stick near the ground with the two pieces of tape framing the last known print. Then move the tracking stick back and forth in an arc. The tip of your pole or stick should be passing over the next print, so study the ground ahead at that point as it moves and see if you can pick it up. If the next track is a left foot, try moving your tracking stick slightly to that side, and vice versa to the right. Be careful not to touch your tracking stick to the ground. This can cause a disturbance or make even a faint impression that can confuse you when looking for obscure sign. This may seem like a no-brainer, but it's easy to get so caught up in tracking that you get tunnel vision, focusing on the ground while forgetting the bigger picture. I've learned this lesson more than once, when I've been so intent on finding the next print that I've failed to raise my eyes from the ground just a couple of feet ahead of me. In those instances, I've cost myself time going print to print when I would have seen a clear print several yards or more ahead. So, make it a point to look up when you're man-tracking and scan the area for what could be your subject's print (or even the subject!) in the distance or perhaps another type of clue. If you're not sure what you're seeing, you can either mark the current print you're on and come back to it if what you find ahead proves not to have been made by your subject, or, better yet, send a teammate to check it out. By marking the last known track with flagging (and a GPS), you're ensuring that you'll be able to return to it if you find you've deviated and followed the wrong path. Or another team can come along and pick up the track. Another important reason to look up from the track is to maintain situational awareness -- watching for hazards, for example -- and this is another benefit to tracking in teams of at least two, so your partner or partners can keep their eyes up as the point person tries to stay on the track. *An outline or perimeter, delineating it from the surrounding surface. This might be a small line or a complete track outline. *A shape, large enough to have been made by a human. This may involve "flattening" and not an actual print. *Contrast--a difference in color, texture or shape from the surrounding surface. This print was most evident from the contrast in texture, the flattening of the surface and the outline. Less light and more focused light is better than full sun. Even distinct tracks can be difficult to see in the bright midday sun. Lighting is so important when tracking. In fact, it can make the difference between seeing a very clear track and seeing no track at all. Actually, I should say "lighting and shadows," because the shadows really make a track stand out. For me, tracking is easier at night than it is in full sun, because I can hold a flashlight at a low angle to the ground, creating significant shadows on any track that's in or near my path. By the same token, it's pretty much impossible at night to look ahead for tracks or clues in the distance. A lower intensity flashlight helps maintain night vision and reduce eye strain, but on a brightly moonlit night, a brighter flashlight might be necessary. When tracking during the day, early morning and late afternoon are the best times to do so, when the sun is at a lower angle thus creating more shadows. Positioning yourself towards the sun can help you see the shadows more easily, or you can try using a wide-brim hat to shade the track and then use a flashlight or a mirror (from a compass perhaps) to redirect light onto it. It's amazing how this can make a track just pop right out, when it might otherwise be invisible. With the sun overhead, you don't have as much--if any--shadowing to make the track pop out. The Point is the person on the track, while the Flankers are to the left and right of the Point. The distance between the Point and the Flankers will depend on things like terrain, vegetation, weather, and the quality of the track itself. When the Point gets tired -- or even before then -- a Flanker can take over that position, and the Point can take the Flanker's spot. I know from experience that our eyes can tire faster as the Point, when we're really focused on those prints and clues, than as a Flanker, so it's good to keep the Point position fresh. Flankers can be helping the Point by looking ahead, trying to spot prints or clues (or the subject) in the distance, which can enable the team to jump ahead and therefore move more quickly. But the Flankers should move ahead ONLY if instructed to do so by the Point. The Point person should remain with the last known track. Flankers should also keep their eyes out for obstacles or dangers that the Point may not notice while so focused on the track. For example, when recently tracking in the desert, I didn't notice that I was about to walk right into a cactus until one of my Flankers alerted me just in time. Of course, this isn't a perfect world, and a three-person team won't always be possible. Tracking can certainly be done by two people, with a Point and one Flanker, or by a single person if necessary. The same principles will apply. It just may be a bit more difficult with fewer sets of eyes to do the work. 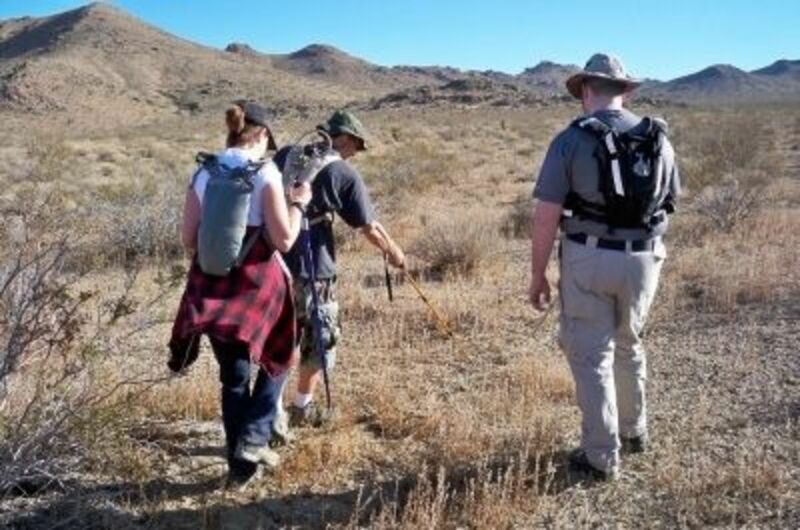 A three-person team follows a track across the desert at a training in Barstow, California. In the event the Point person loses the track, or in the interest of moving ahead more quickly than going print by print, he or she can request that a Flanker move ahead to "cut for sign." The Flanker should make a wide arc away from the Point and then back around in front, coming full circle to the other side of the Point if necessary. If that Flanker finds nothing, the other Flanker may be directed to cut for sign, circling around in the other direction. If a Flanker finds a track or clue, then the rest of the team should move up. The Flanker may, at that time, take over as Point. Note: Some tracking teams use different patterns to cut for sign, including an S-pattern or a box pattern. The objective is to try to cut across the subject's path and intercept sign up ahead. The Flanker wants to minimize the chance that he or she will be walking right over the track. 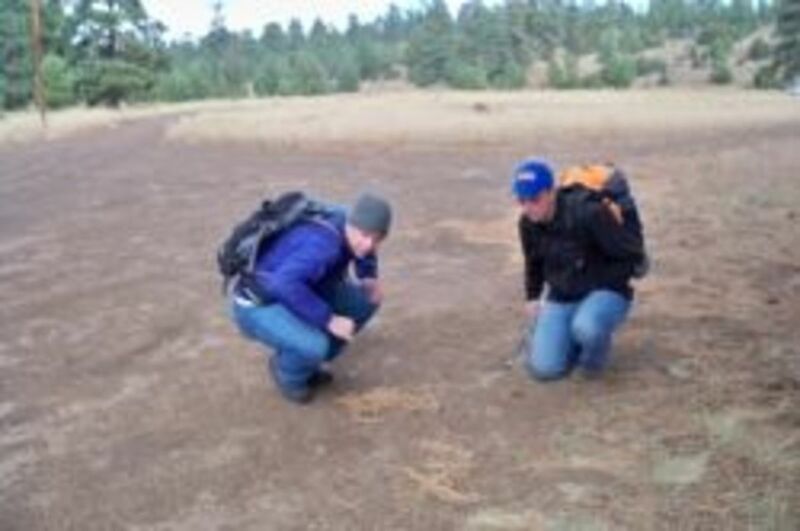 If you lose the track, send a flanker ahead (attempting not to destroy sign along the way) to check areas where tracks or sign are likely to show up more clearly, such as patches of dirt in an area that's otherwise covered with pine needles or rock. 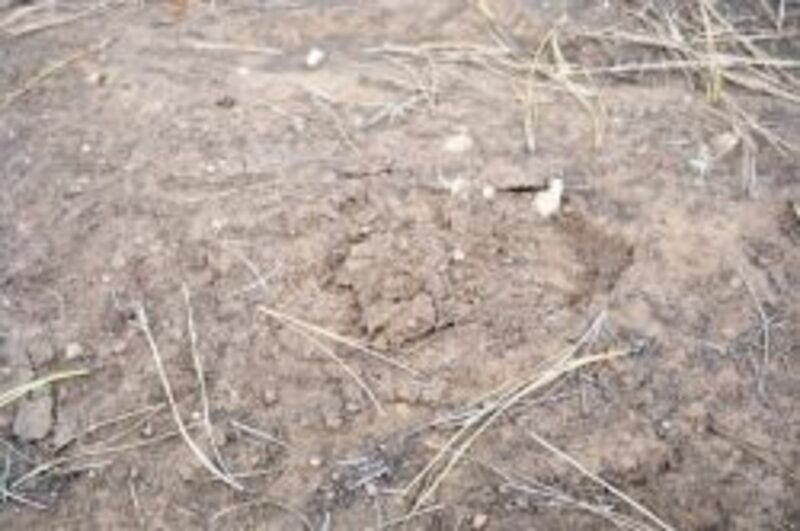 Open soil, muddy river banks, dusty trail edges and wet sand are all examples of good of track traps. Of course, as the tracking team is following prints and clues, they too are leaving behind the same, which can confuse matters. The way some trackers indicate their own prints is to drag their tracking sticks alongside as they walk. I've heard this called the "international sign of a tracker," so it should be recognized by everyone involved. Obviously, this practice would be viable in more of a desert environment than in a thick forest or grassy area, which is one reason this isn't done by all trackers. 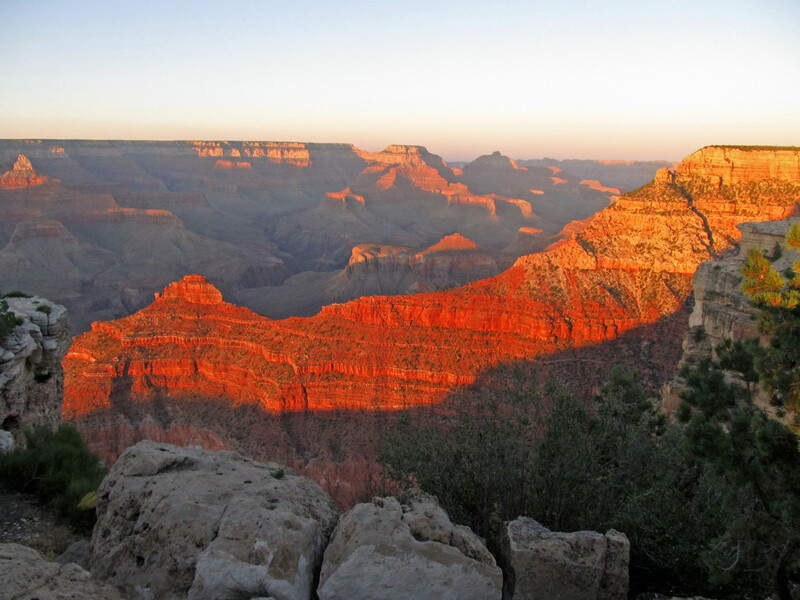 In dirt or sandy terrain, however, it makes much more sense, and, for that reason, this practice is often taught in areas like the desert southwest, where I live and train. If dragging sticks is done in your area, flankers who are asked to cut for sign should remember--or be reminded--to drag their sticks as they go. It's easier on the arm, by the way, to drag your stick slightly behind you. 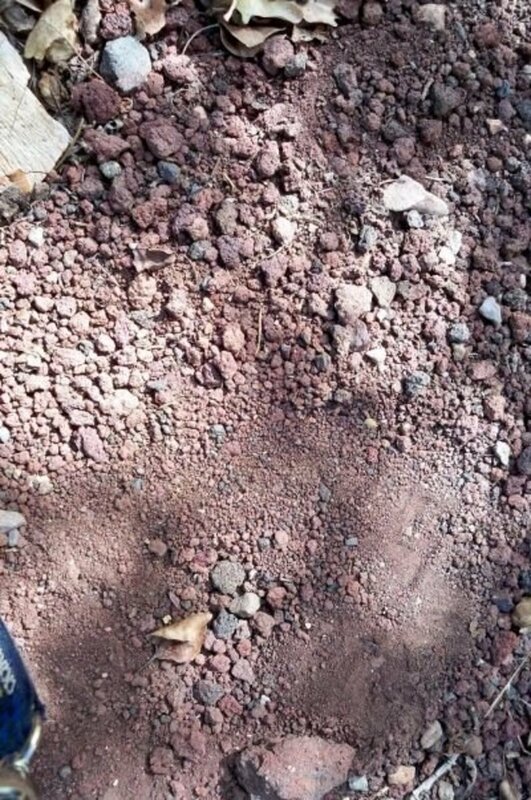 Sometimes there will be no print at all, but if you're using your tracking stick to find the next footfall, it may be evident by a disturbance or displacement of a rock. A Flanker cutting for sign may also notice rock displacement, thereby allowing the tracking team to move ahead. 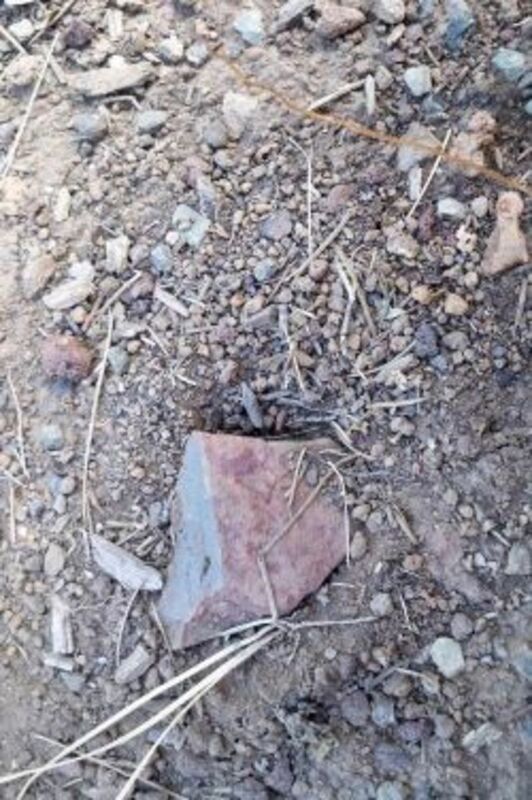 A displaced rock may still be embedded in its original spot, but you might find that it's been pushed slightly away from the dirt that was once right up against it. The location of this resulting space caused by the person pushing off as he or she walked will indicate direction of travel. 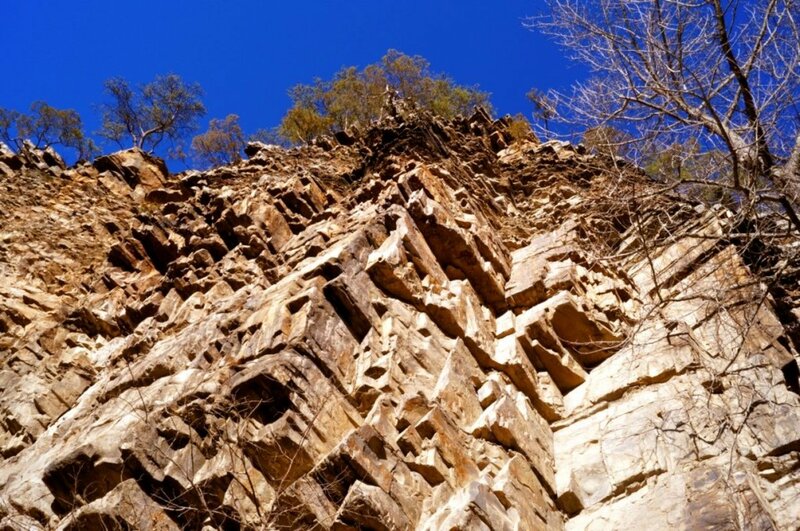 In this photo, the larger rock in the center has been pushed back slightly, resulting in a space at the top. This indicates that the person was walking towards the top of the photo. There are other indications of a footstep here, as well, including flattening of the small pebbles and pieces of vegetation and a disturbance on the other side of the larger rock, towards the bottom of the photo. "Shine" is a type of track left behind by the flattening of vegetation or another surface, leaving behind no print design. The track is evident only by the way the sun or other light source reflects on the flattened surface. You often have to circle an area, looking at it from different angles, to spot shine. Sometimes all that might be left behind from a footstep is the depression made by the toe of the subject's shoe, made when pushing off to take the next step. This will often be the case in deep sand, cinders, or other soft surface that won't hold a print. Repetition is one indication that you're looking at a series of toe digs. In addition to actual tracks, shine, disturbances or rock displacements, keep an eye out of additional clues. For example, if you know the person you're tracking is a smoker, watch for cigarette butts. Trail bar or candy wrappers are another type of clue. There may be blood droplets if someone has been injured. Look for broken twigs or branches, water splashed on rocks, pieces or threads from clothing, dried mud that's fallen off someone's shoes, dew or frost trails, toilet paper or even human waste. The possibilities for clues are great, so watch for anything that "doesn't belong." And don't forget to listen too! Any sound out of the ordinary may lead to your subject, including the sound of breaking twigs, a person moving through brush, or maybe even their voice or a whistle in the distance. Sometimes birds make a lot of noise when something or someone has invaded their territory. by the Central Adirondack Search & Rescue team You can download free PDF files of the manuals here also. You can add your tracking-related content to this website and read what others have contributed. The Georgia Trackers Alliance also provides tracking classes to the public. Joel Hardin Professional Tracking Services offers courses that combine classroom and field exercise training. The "Identifying Sign - Tracking Basics" course is designed specifically for new students to provide the terminology, tools and techniques of tracking. There's also a Tracking And Signcutting Club--a Yahoo! Group--which you can join and find out about additional tracking courses. Professional Tracking Services is a Reno, Nevada based organization dedicated to the art of tracking. 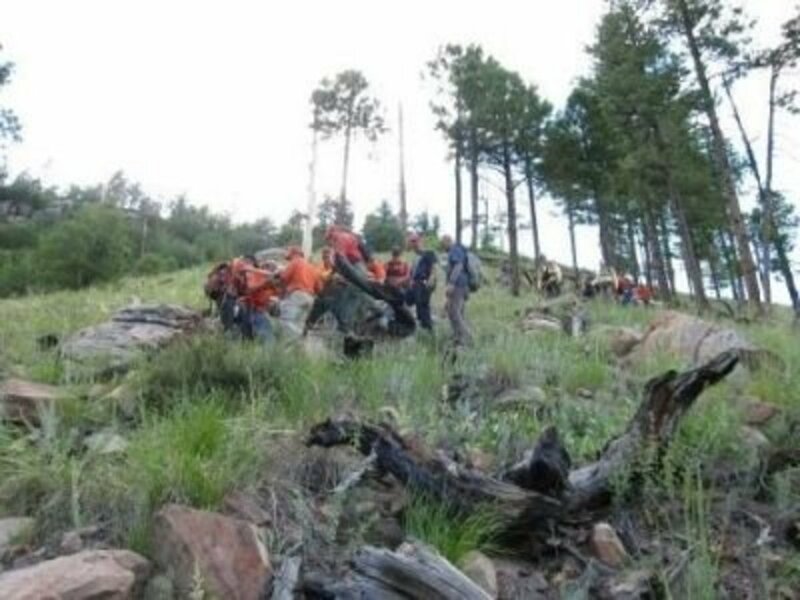 The primary goal of this organization is to provide high-quality, low cost instruction to search and rescue groups for the purposes of locating lost or missing subjects. Universal Tracking Services, Inc., providing training courses and seminars to students from Search and Rescue, Law Enforcement, Emergency Services, Military and other organizations throughout the United States and Canada. If you know of a tracking team not included here, let me know in the Guestbook below, so I can add it. 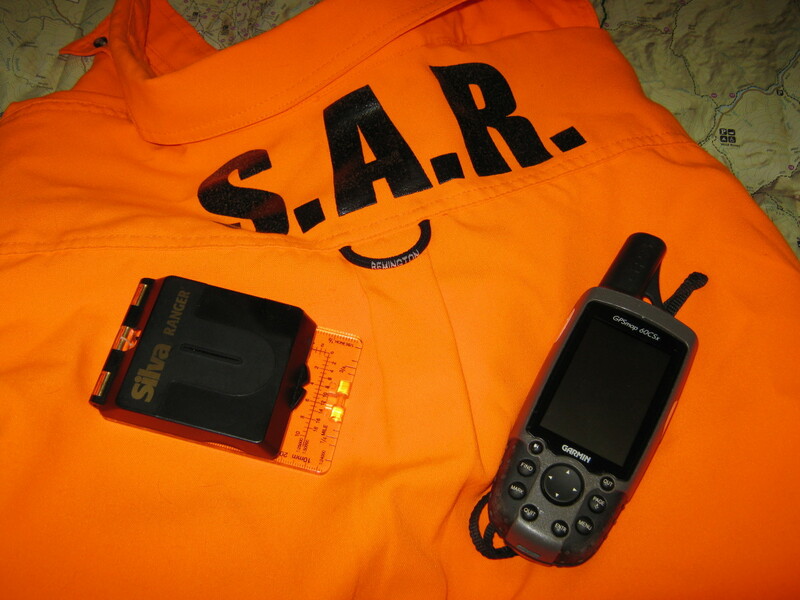 The SAR Tracking Institute provides trained visual mantracking resources for lost or missing persons. GTA provides "trained personnel to respond to visual tracking resource requests by any official agency, government agency or qualified individual" and tracking education to the public. 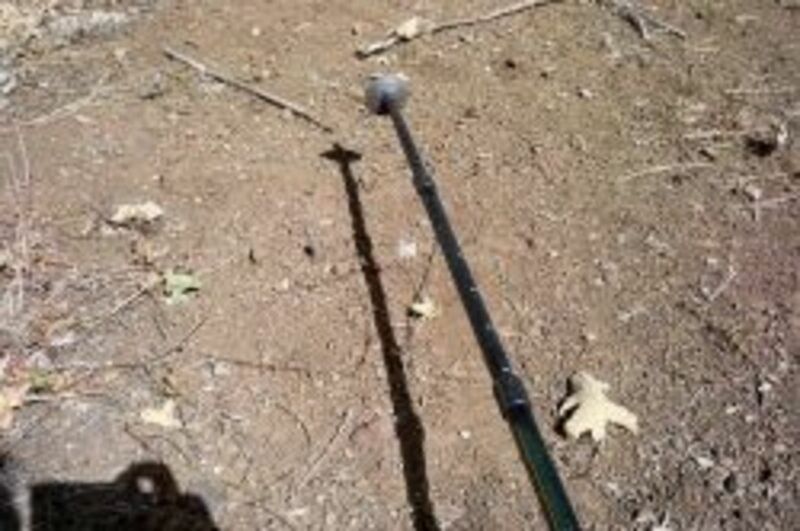 Use this as a tracking stick (and a hiking pole) for measuring the stride and the print. While you can buy a thinner, lighter stick specifically made for tracking, I prefer getting multiple uses out of my gear. I have a precursor to this model, the Garmin 60cX, which you can sometimes still find on eBay or Amazon, and mine is still going strong after several years of use. This newer version of that model is the one many of my SAR teammates are using. Flagging tape: For indicating the location of the print or clue as well as marking a route for you and others to follow. If you lose the track, some flagging can make it much easier to go back and try again. It also helps to preserve the track, making sure others don't accidentally walk over it. Signal mirror: Even during the day, it can be difficult to see tracks unless the light is at just the right angle. Redirecting and focusing the sun on the ground can really make a track "pop." Tailor's measuring tape: In addition to measuring the width and length of the print, you can take other measurements to help identify it (or discount it) as your subject's track. Build your own man-tracking kit here. If you haven't heard of this show already, I thought you might find this interesting. This reality TV series is based on a mounted tracker, Canadian cowboy and active MSAR, Terry Grant, in a variety of challenging terrain. In each episode, Grant has a limited time frame to "capture" two volunteer (fake) "fugitives" who attempt to elude their pursuer and reach a designated point, which is unknown to the tracker, before a certain time the next day. The "fugitives" have a map and compass. The Mantracker has a local rider who knows the territory assisting him and sharing knowledge. Sometimes one or both of the "fugitives" make it to their target destination, but often the Mantracker captures them. There was a book years back that was called "Man Tracking." Is it still in print, and where can it be located? Have you checked Amazon for third-party sellers who may have the book if it's no longer in print? I would check there. Comments Or Questions About Man-Tracking? - Have you done some tracking yourself? I'm a tracker dogs trainer for the Police here in Botswana. I wish you can furnish me with more details of this programme so that i equip my men with man tracking skills. It's very important. Please assist me. Check out the BC Tracking Association (BCTA) from British Columbia, Canada and see what we do in our part of the world. Many thanks for tracking articles. Tracking is my hobby as well. Your information is great and I know it to be spot on because, after quite a few years of harassment from some guys on our over 2-acre property, I decided to go out into an area they were trying to distract me from a few times, using fake prints as one of their methods, and I finally located the exact spot where they were travelling in and out onto the land complete with broken and cut tree limbs, clumps of small trees downed by saws, pink/black striped plastic strips that they had hung onto tree limbs several years back - their markers are interesting and helpful in following them - and the lines of "human" shoe/boot prints that were actually theirs. Thankfully, by really being observant of the entire surroundings, at eye level, ground level and beyond, I was therefore able to find a long trail they had made and been using which discreetly, and sidewinderishly, went through the brush. At this point, I am not sure exactly how to handle the situation but am working on putting an end to their in and out travels onto the land to harass us. Thanks for some of the best content around! @captainj88: Thanks! And me too! (&lt;--hope we don't have to come find you) I'll have to look up that author you mentioned. Sounds like something I'd like. Very interesting lens. My Father taught me animal tracking in the 50s when I was growing up. I used this experience in later life as a Legal Investigator on accident scenes. There are so many great ideas in this lens I'll have to come back and make some notes. Thanks for really good content. Very interesting and well presented. You have a lot of great info here! Wow, this is perhaps one of the most interesting lenses I have read here. Thank you for sharing. Great lens... very aesthetic and visually captivating with excellent information! Very informative lens! My friend and I were hiking today talking about training her Shylo Shepherd for tracking this spring, Thank you! I wish I could always have this information handy when needed- it's probably very frightening to look for someone who is missing and don't know how to do it the right way. Are there tracking classes in Kentucky?? No, not KY, but somewhat close. www.trackersedge.com. I got into this business because there were so few training lectures being offered and then they were hard to get into. Feel free to contact me at sales@trackersedge.com Good Luck! Very interesting topic. The Australian aborigines are known as some of the best trackers in the world. wow... what an amazing skill set you have. I'm so glad to know there are people out there like you to help find those who are lost. I never realized tracking involved so much work (and patience). I always thought it was like they show on tv, 30 people beating around bushes with dogs leading the way. I so wanna become a dectetive. Great lens!!!! Loved the info it was very interesting even though I will hopefully never have to use it. My son will love your lens! He is Boy Scout and finds anything outdoors exciting! Believe it or not there are not a lot (maybe no) tracking training offered in Canada or the north east U.S. States. Amongst other things, my business offers up tracker training. My training is very casual an not intimidating. My lessons are intended as an introduction to tracking that may assist people to pursue tracking as a profession or hobby. This is a great site. You have done a great job promoting and describing tracking in a concise and informative way. Keep up the good work. For a city boy this is a really informative lens. Thanks for putting it together for the good and benefit of us all. Awesome knowledge. Deb....First, I am glad to see the Rocky Mountain Trackers listed as a tracking resource. I am cofounder, and current VP of the org. Our 6th birthday is tomorrow! I wanted to mention a tracking school that you don't have listed. It's Universal Tracking Services (www.utstrackingservices.com). I have been to a couple of schools for hundreds of hours of training over the last 11 years and they are definitely worth a mention. Thanks so much and thanks for the good read! This was fascinating stuff. Was curious about the facts behind tracking. Thanks for enlightening me. Oh wow, this is so interesting! I love the dragging a stick part to show that you are the one doing the tracking. The closest I come to doing this is trying to follow animal prints in the snow and figure out what made them... I thoroughly enjoyed reading this. Looks like they could do a few shows on CSI about this and also incorporate your animal search &amp; rescue information. Double congratulations on making the best into list twice!! That's pretty cool. Back to congratulate you on making The Best Squidoo Intros Ever list and I think you made it twice, didn't you? That is some good information! Hope I neer have to use it! Wow -- really interesting info! Blessed. Very cool and informative. Reminds me a little of reading Louis L'Amour books when I was younger! There is a fab TV show on just now in the UK "mantracker", It is amazing how he finds these people, and they try every trick in the book. We love it, the tiniest signs of someone being there, it is amazing to watch. So next time my hubby asks? how does he do that I can tell him! Thanks for the explanations. I had no idea that tracking was so complicated. Great explanation. have you seen the show "mantracker"?...I love it! Great Lens! So glad I found you! Might share some of your info on my Blog too! Very cool gift ideas! great lens, great suggestions. Another great lens. I always learn so much when I read your stuff. 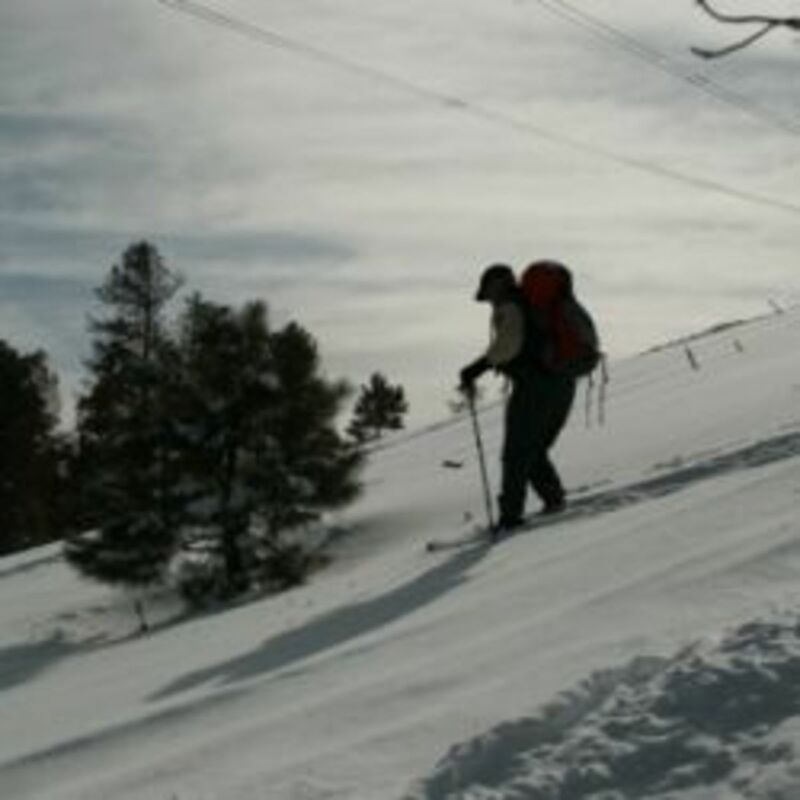 I have had many adventures in the great outdoors, but I have never tried man-tracking. Now I want to try it. Thanks for the great lens. 5*s from me, and a fav of course. I have returned to say Congratulations on being chosen the top "How To &amp; DIY" lens in the Giant Squid Challenge (100 club). Angel Blessed and added to Squid Angel Mouse Tracks! Very important information that we all can benefit from. Thank you. Great tips! Excellent work Deb! Wow this was amazing. I had no idea tracking was so involved. This is a really great lens. What an extremely interesting lens! Some of the information seems so obvious, but if you had never considered it before, it probably would not occur to you in a time of need.